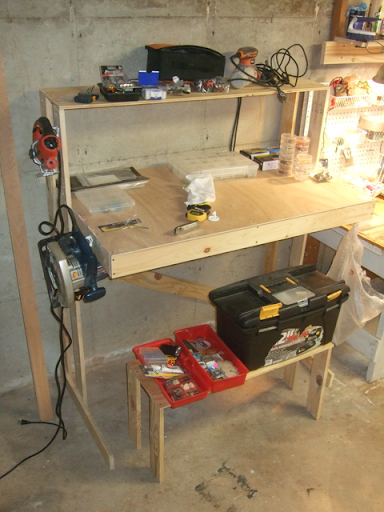 My manshop came with a sturdy bench, on which I installed a new deck and pegboard backing. That is a good surface for working on small projects, but as my collection of tools grew in the last year, I ran out of good places to put them. I thought that I could build a standing-height multi-level shelf and working surface out of some boards I recently found on the side of the road, which had a lot of stubbornly un-removable industrial staples in them. I put it all together in two hours, which included stopping and figuring out what it would look like as I went. I never had a coherent plan for it, but I think it turned out quite satisfactory. The main surface and the top shelf and the top of the bench (the unconnected lower shelf) are build from pieces of scrap plywood I'd saved from earlier projects. I built the main surface first, then figured out how to use the four vertical support boards to hold together the main surface, the footer boards, and the shelf on the top. The whole thing would be wobbly if I had not included a diagonal board on the back of it, to prevent the structure from shearing. The disconnected bench/shelf was an afterthought, when I realized that there was no good place on the rest of it to put the toolboxes. I used salvaged hooks to hang the power tools on the side, and leftover screws to put it all together. The total expenditures for this project was exactly zero. Eventually, I would like to replace both workbenches with a single, large workbench.